It seemed like just what the doctor ordered to help this family surge out of our sick-inspired doldrums yesterday, this thickly swirling, fat-flaked snowfall that was the first of the year. 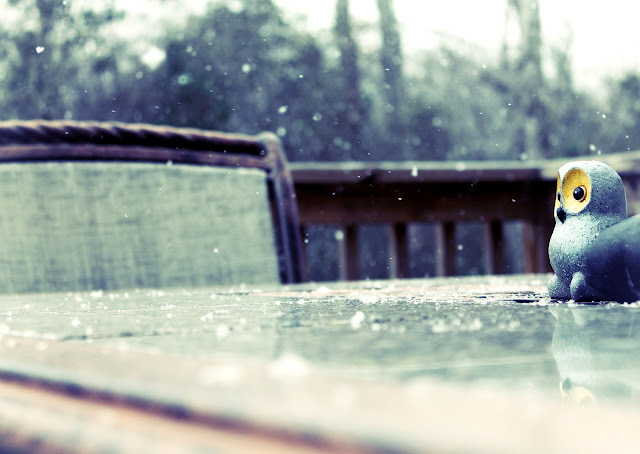 Facebook and Instagram exploded with exclamations "It's snowing!" and snapshots proving that clumps of snow really had gathered on the lawns because by the time the kids came home from school it was already gone. Luckily for KC, he gets home at noon and was able to don his boots and puffy coat and dash into the "woods" behind our house to explore. 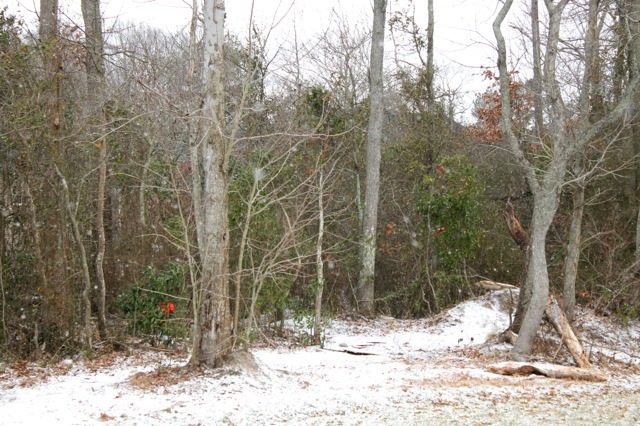 I watched him, camera poised, and recalled the magic of the many first snowfalls I played in as a child. The best time to play outside was just as twilight crept in and the pink-grey sky hushed the world and my sister and I left patterns of footprints all over our pristine yard. We felt as if no one else existed in the quiet universe, just us, our numbed hands, the only sounds that of frosty flakes melting on our eyelashes. KC came in after only a short while, his tiny nose dripping, his pants damp with melted snow. He had had enough fun in the snow and wanted his lunch. My older boys came home from school declaring that they had been allowed to go outside at school for ten minutes just to experience the snow. ZJ froze in his gym shorts and sweatshirt - no hat or mittens - but loved every minute catching snow on his tongue. The best part is that we are expecting accumulating snow again this afternoon - maybe an whole inch! There is already talk of canceling basketball practice. I have to laugh but at the same time I hope they do cancel it so the older boys get a chance to play outside in the snow as well. It'll be back in the 60s next week so we may not have the chance again this winter. I am finally getting my energy back after being sick for so long. Time to actually move the Christmas decoration boxes all the way into the attic and get this house tidied up for a busy weekend. Hubby and I are on for date night we want to got to a movie. Not sure which one it will be. Any suggestions? I saw Les Mis and loved it. Especially if you are Catholic I think you should see it. What a story of redemption and the role the Church has played in many people's conversions. My husband has read all the Jack Reacher novels and is devastated that Tom (tiny) Cruise is portraying a character described as 6' 5" and 200+ pounds in the books. Maybe we'll end up just going out for dinner! That remark about Tom Cruise just TRULY made me laugh out loud! :) I have read those novels, too, and totally agree with your husband. My sister and her husband saw Zero Dark Thirty and said that it was wonderful (and real). (He is going to be deployed back to Afghanistan on Wednesday, so can you please say a prayer for them?!) So glad that you are feeling better! Have a wonderful week.